John Gould’s The Mammals of Australia is one of the most prestigious and familiar natural history work published in the nineteenth century. The picture of the thylacine pair is the most frequently copied and reproduced image of the species in the nineteenth and twentieth centuries, and is still circulating in various forms today. 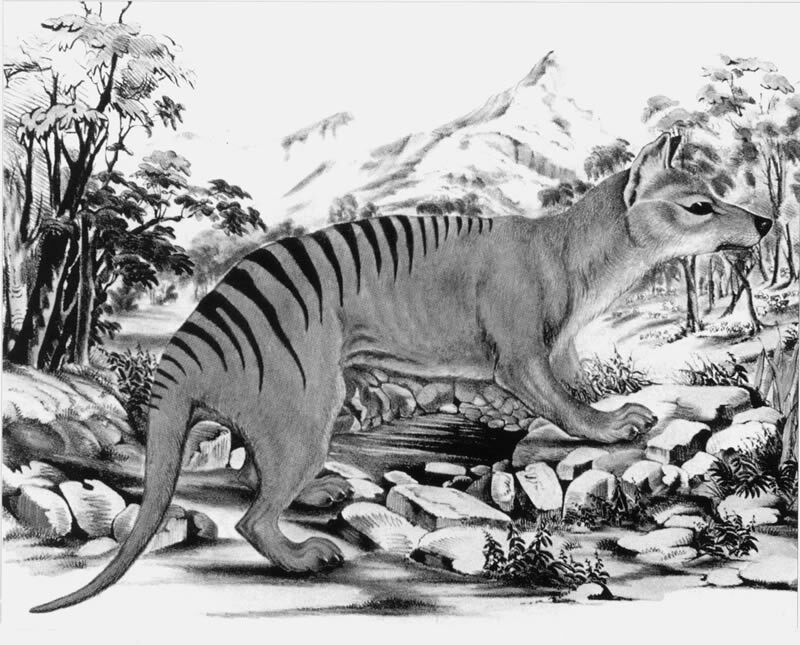 The lithographic images in Gould's book depict thylacines with dark, slanted eyes and threatening expressions. They operated intertextually with countless other constructions that served to define anything in the vicinity of the East as depraved and other – “a political vision of reality whose structure promoted the difference between the familiar (Europe, the West, ‘us’) and the strange” (Said). But these prints convey a very different impression of the animal than that expressed in a preparatory drawing for the lithograph now housed in the Earl of Derby’s collection at Knowsley Hall near Liverpool. The drawing was made ‘from life’ by H.C. Richter and it is apparent that it was later transformed to conform to the canons of taste operating in Europe in the nineteenth century. As Gould states in the Introduction to his multi-volume work: "neither the shepherd nor the farmer can be blamed for wishing to rid the island of so troublesome a creature" (Introduction, 1863). 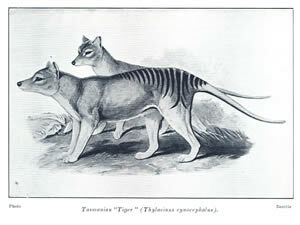 The pair of thylacines that were models for the drawing arrived at Regents Park Zoo, London, in 1850. They were the first of the species to be displayed in a European zoo and great excitement accompanied their arrival. Artists and writers invested their representations of the species with particularly obvious signifiers of the exotic, savage and strange. For instance, the large plant beneath Gould’s ‘head of a male’ is not endemic to Tasmania, but is similar to plant species that grow in tropical environments. 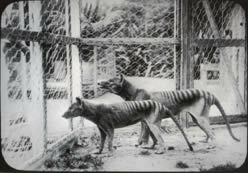 Thylacines at Beaumaris Zoo, Hobart c1918. Collection: Tasmanian Museum and Art Gallery. 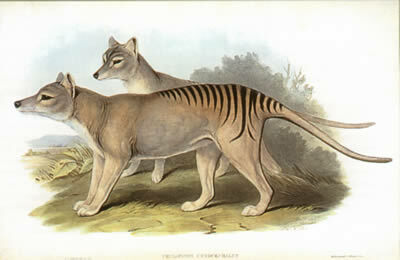 The position of the pair at London Zoo captured in Gould's lithograph is mirrored by the thylacines photographed at Beaumaris Zoo Hobart about 1918. Gerald Krefft, director of the Australian Museum in Sydney in the 1870s, produced a cheap Australian alternative to Gould’s work. His preface informs readers that the pictures in the book were originally published for the Council for Education in NSW and were hung on the walls of classrooms as “Object Lessons”. His book was also aimed at a juvenile audience. 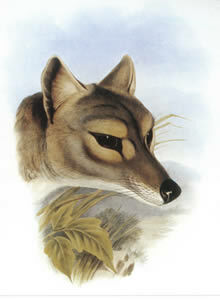 Note the 'cunning' attitude of the thylacine and its predatory pose. Beneath the trees on the right of the lithograph, a flock of tiny sheep grazes peacefully. 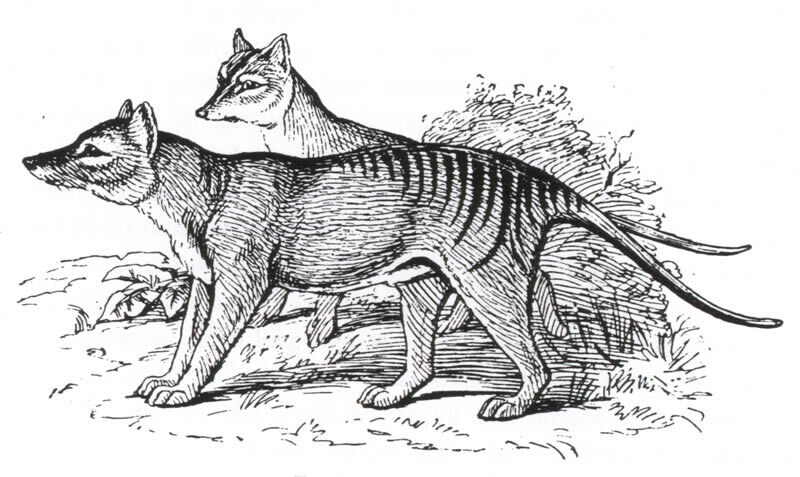 The Mammals of Australia, 1871. The Council of Education [NSW] will perhaps allow me to appeal to residents in the Country districts for contributions to our national collection. The Echidna and the Ornithorhynchus [platypus], shot during August, September and October, but especially their young, being the most desirable donations. Birds and Mammals of Australia, 1884. Lithograph. Tasmanian author Louisa Anne Meredith traced Gould’s picture for her work Tasmanian Friends and Foes. 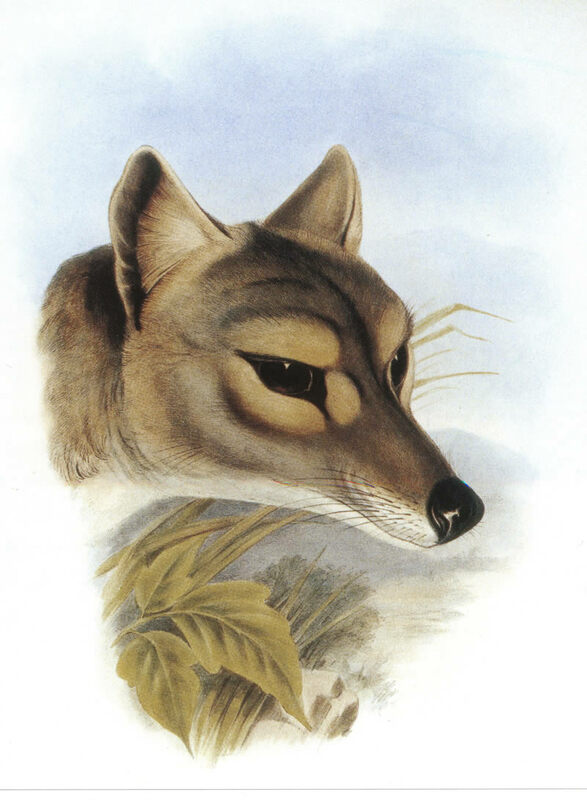 Although sympathetic to the thylacine, in a previous book called My Home in Tasmania she commented that a young, captured thylacine “resisted all endeavours to civilise and tame it”. The animal was killed and its skin made into a rug. “my living thylacine is becoming tamer: it seems far from a vicious animal at its worst, and the name tiger or Hyena gives a most unjust idea of its fierceness”. Tasmanian Friends and Foes, 1881. Clive E. Lord, and H. H. Scott. 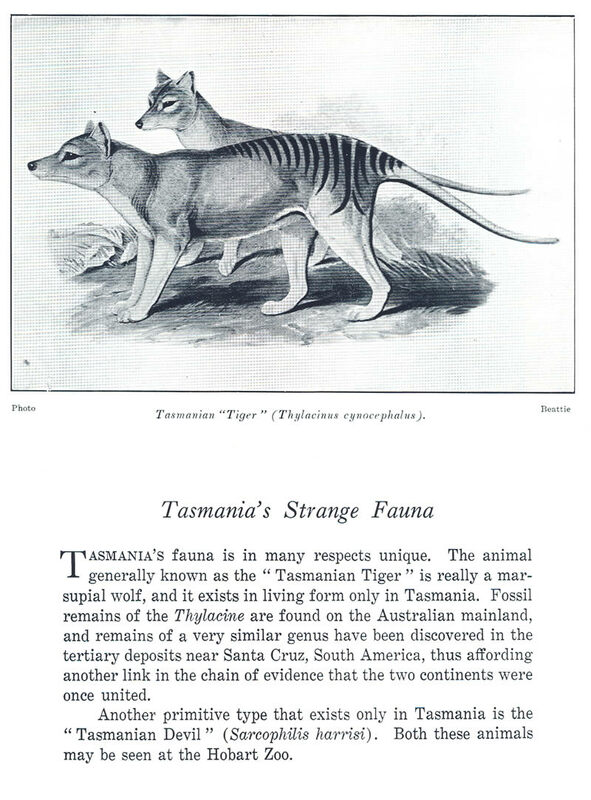 A Synopsis of the Vertebrate Animals of Tasmania. 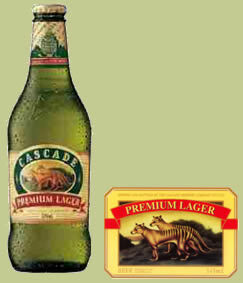 In the twentieth century, the label of a Tasmanian brand of beer, Cascade premium lager, ensures that H.C. Richter’s illustration of a pair of thylacines has a constant presence in Tasmania. The exotic foliage has been eliminated from the picture and the animals’ stripes are continued down their tails, but the figures’ slanted eyes are retained. These strong, resilient thylacines are appropriate for the label of a drink traditionally marketed with male consumers in mind and the image has a larger audience and greater economic power than was ever dreamt of by Richter or Gould. In the second half of the nineteenth century the cheaper printing method of lithography (Greek, meaning ‘stone writing’) was a common medium for natural history illustrations and resulted in more images being included in a book. Lithography is essentially a chemical process. A drawing is made with a greasy crayon on limestone, then gum arabic and nitrate acid is rubbed into the material, changing its molecular structure so that when ink is applied it adheres to the crayon marks, but not the stone. Fine details are more difficult to achieve, but tonal qualities are easily suggested and it is possible for a drawing to be made directly onto the stone. The result is a more spontaneous impression, with the broad, fluid lines of a crayon and tonal planes producing a much softer or subtler result than that produced by the black and white linear imprint of engravings. Lithographs often mimic pastel drawings or pencil sketches. 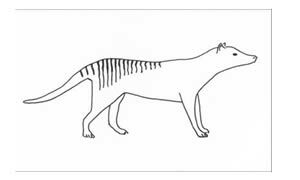 Illustrations of the thylacine made with this method have a delicate, pictorial quality; they are understated, often ambiguous and achieve their objectives by using stylistic devices, rather than the pictorial signifiers or intertextual references by which engravings convey their messages.